This place located only three hour boat ride from Jakarta. We can travel from Angke harbour, using the normal passanger boat, and then get ready for three hours sea sickness. The view is great, unless if we count some trash around Muara Angke. The government should really organize this place more, since many and more tourist come in the latest years. The boat stop at Harapan island, then we continue our ride using a private boat, a non exclusive one, which own by our guide, Mr. Man. Just like the boat, he also own the cottage, the only sea house located in the island. It was once owned by a rich man, or a foreigner, i forgot, but the point is, this place is now left unowned and Mr. Man with his family organize it and made it a new tourist spot. Actually, most of the fishers in Angke did it. They rent their home to traveller to stay and rent their boat for hoping island to enjoy the magnificent view of thousands islands which in fact only consist of 105 islands. They all hyperbola, yes! The journey straightly begin that day, but we decided to put our luggage first at the cottage. The island was quite, and so beautiful to calm down and sit back. The cottage located right in front of the shore. We can see the waves dancing and enjoy the heat of the sun. But behind the house, we did not want to predict anything since the whole back yard are bushes. There might be some wild animal, or ghost? i don’t know. We are the only person who stayed there. While walking around the island in the morning, we found out that there is another small deck in the other side of the island. It was used as another quay to get to the island, but now it was broken already. We can still walk slowly on it, but in some part, the woods already smashed. A friend of mine still enjoy jumping from that board strightly into the ocean. Seems so fun! 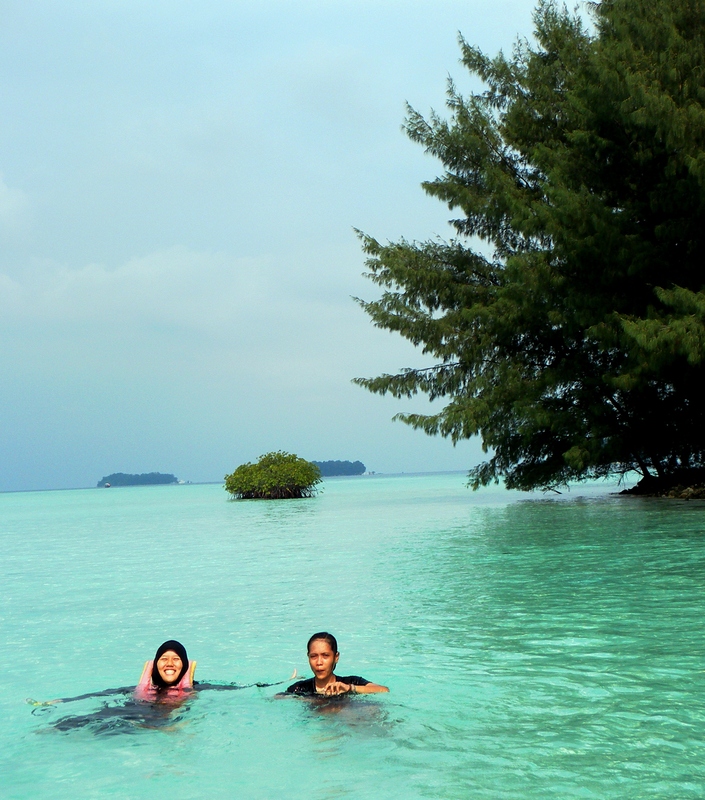 In the whole two days, we visit Atol island, Dolphin island, Pasir island, Kayu Angin island and Bira Kecil island. All islands show its natural beauty to us. With clear water, tosca into blue colour, and definitely pretty little fish and amazing coral. Yups, the coral here are colourful, big, and mostly alive. It still breath somehow. Many small fish or sea animal-which i dont know what- show up, we all surprised. In fact, this is the most fascinating experience while we are in the water. I like playing with the fish. Catch them in silent and then surprise them with my presence. I took off my life jacket to get deeper in the sea so i can catch them with my hand. But then, while i was so excited and happy to run after those fish, i suddenly arrived at the deeper ocean. I am panic! i cant swim very well. So lucky i still hang one of my hand to my life jacket so that i was not drowned. Right after that, with my heart still beat fast, i always make it sure that the fish wont fool me again. Its so scary.